I had discussed Obi and other home phone options in an earlier posting. At the time, I did not follow through because there was concern that Google Voice support was ending which would have resulted in the need to pay for service through a VOIP provider. Although this option may have yielded some savings over my Time Warner cable phone, the savings would not be as significant as being able to have free service through Google Voice. Well good news! Obihai has worked with Google Voice so that Google Voice is now a supported Obi service! So one slow weekend day, I pulled the trigger and ordered an Obi100 from Amazon which included free shipping. As is customary with Amazon, the package arrived timely and was well packaged. Contents are reflected in the picture above. I will note that the device was much smaller than I anticipated which is a good thing as I anticipated something that was going to consume valuable desktop space. (I'm sure that the Amazon site probably provides measurements, but I did not pay attention to that. I've pictured the device next to my coffee cup to provide some size perspective). And more good news – Obihai has made the set up super simple and integrated an option to register your device using your Google sign-in which then steers you into an automated set up for Google Voice. The set up boils down to these easy steps. 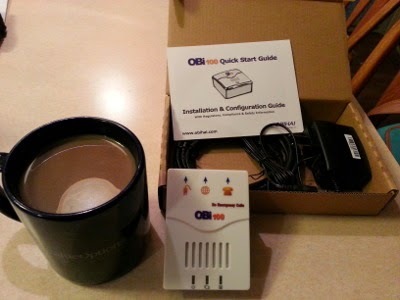 Set up device – super easy – plug Obi into router, attach your phone wire and plug it in to electric outlet. That's it! My biggest challenge was finding an available AC outlet. Register & “sign in with Google” and follow the easy walk through instructions. I got a little confused where it asked to enter area code to enable 7 digit calling because I over thought the question. All I needed to do was enter my Google Voice area code. I was also nervous when it asked me to dial into the server and later when I needed to wait a minute or so for the configuration to set up, but it worked flawlessly. Next I made a couple test calls – first to work and then to my cell phone to verify that the phone was dialing and working as advertised. In my initial call testing, I had hooked up a spare base and cordless phone. I was initially concerned about the call quality, but quickly diagnosed that it was the spare phone (which had sat unused for a couple of years). When I switched the line to my existing Time Warner base and cordless phones, it worked smoothly and I didn't detect a noticeable call quality difference. The only notable difference that I was able to ascertain is that there did seem to be a very slight lag in the dialing. On one incoming call, my caller indicated they received a message that they were connecting to the Google server (or something to this effect). I suspect the minor delay is the work of this intermediary server, but I have not scientifically verified that this is the case. One question that I had regarding the Obi which I didn't find clearly documented was whether you could plug in a base unit and expect the other cordless phones that work with that base to work properly. I answered this question by testing and yes, my base and associated cordless phones seem to work as normal. I purchased my Obi in reaction to a recent Time Warner bill where the cost for my “triple play” - TV, Internet and Phone had moved toward the $150 per month mark. I felt this was beginning to get excessive and the most likely candidate of my “triple play” to drop would be the phone service. After ordering my Obi, I took a quick trip to Time Warner's Colonie Mall store and expressed my concerns to a rep. When I expressed that I was considering dropping the phone, the rep related that it probably wouldn't be worthwhile and “let me take a look.” To my delight, the rep quickly offered a better rate for my existing “triple play” package putting my monthly cost closer to the $100 mark. While I haven't fully abandoned my contemplation of dropping my Time Warner phone, this rate change has given me pause for the moment. First, overall Time Warner delivers good customer service. Second, the Time Warner Phone does include E911 so there is a value to this service. Note: Obi clearly notifies you that Google Voice & Obi does not provide E911 (electronic 911). You cannot simply dial “911” for emergency services and have a dispatcher know your location. There is an option to sign up for E911 with a secondary provider for around $15 per year. If you are going to use Google Voice and Obi as your only home phone this extra service may be worth consideration. In reading through many reviews from Amazon, it was clear that many subscribe to a second (pay) service with the Obi to provide a measure of redundancy – simply stated as a backup should something arise where Google Voice becomes unavailable. The most attractive choice to me is Anveo's bottom plan which is around $40 per year and also includes E911 (which would cost around $15 by itself). Another interesting feature in the Anveo package is the inclusion of some online faxing. While I do not have a frequent use, I could envision this as being handy. Q1. Is there a cost to port a number to RingTo? - However, there may be a cost from your current provider to port out. Q2. With RingTo you need to purchase E911 from Anveo. So will this take up 2 SP slots? 1 for Anveo and 1 for RingTo OR does Anveo (E911) and RingTo take up one SP slot? This is important as I would like to keep Google Voice on SP1 and the OBI100 is limited to 2 SP slots. A2- You will need to upgrade to the OBi200 if you want more than 2 services. As you are correct that Anveo takes one, RingTo takes one and GV takes one. The OBi200 supports 4 services (the new OBi1032 supports 6 services, by the way). RingTo would be appealing to me except for the service provider limitations of the Obi100. The Obi100 only allows 2 service providers to be set on the device and RingTo requires that you purchase E911 service from Anveo. Thus, if you have the OBI100 as I have and choose to go to RingTo, you can no longer use the device for Google Voice. Tip: If you'd like to take advantage of using RingTo's free service AND also want to use Google Voice, you may wish to consider purchasing the OBI200 which permits 4 service providers to be added to the line. Thus far, I am only using my Obi to provide a free second phone line using Google Voice. I would estimate that with the discounting for my Time Warner “bundle” if I dropped my Time Warner phone, I would likely save around $8 - $10 dollars off my cable bill (TWC would discount less for less services), so perhaps saving $100 - $120 annually from the cable bill. This would be offset by paying someone else $40 or so for a net saving of around $60 to $80. This amount of savings doesn't entice me and I would prefer to pay the $60 to $80 to avoid the “hassle” and uncertainty of dealing with another provider and porting a phone number. Nonetheless, I am enjoying the convenience of a second line and Obi is a potent weapon to have in my arsenal to leverage my negotiation with Time Warner when that bill starts to creep back up. I should emphasize that my household are light cell phone users whereby we subscribe to "pay as you go" type cell services and continue to use the home phone as a "primary" phone. Thus, a reliable and hassle free home phone is extremely important to us. For those households having a somewhat opposite profile (heavy cell; light home), I can easily see the Obi / Google Voice option providing a free option to completely replace a home phone.